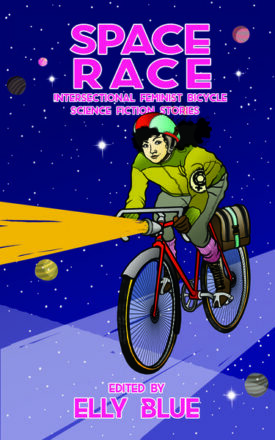 Bikes in Space is an annual anthology of feminist bicycle science fiction. Read the current call for submissions here. Initially intended as a one-off project, Vol 1 was the 10th issue of Taking the Lane zine. Bikes in Space Volume 3 is Pedal Zombies: 13 Feminist Science Fiction Stories came out in Fall, 2015. Our first Bikes in Space novel, Emily June Street’s The Velocipede Races came out in April, 2016. Bikes in Space Volume 4 is Biketopia: Feminist Bicycle Science Fiction Stories in Extreme Futures and came out in August, 2017. Bikes in Space #5 is Bikes Not Rockets: Intersectional Feminist Bicycle Science Fiction Stories and comes out in December, 2018. Bikes in Space #6 is Dragon Bikes and comes out in January, 2020. Submissions are open for Bikes in Space Volume 7. The theme is trans and nonbinary authors writing trans and nonbinary characters. Read the full call for submissions here.